We asked you about a town hall forum. Here are the results. Results from an online survey conducted Sept. 1-16, 2016 to improve town halls at USAG Bavaria. GRAFENWOEHR, Germany — U.S. Army Garrison Bavaria Public Affairs staff canvassed the community to align the format of future town halls with public demand. The result? Most say go virtual. The USAG Bavaria community provided feedback to Public Affairs staff through an online survey in November, along with several focus groups and its first town hall of 2017 hosted March 28. The garrison wants to improve the way it delivers information and addresses problems. It wants to create an informed, empowered community base. It wants to equip Soldiers and families with the resources to vocalize concerns, enact change and connect with others. With such a large population, this is no easy task. Current communication efforts — articles, Facebook and Twitter, a responsive website and the ICE system — are extremely useful, and for the most part, the public is tapping into them. The problem? Their current use offers little opportunity for follow-up discussion or for individuals to ask questions. The Public Affairs Office revisited the idea of using town halls March 28. One aim was to gauge community interest and support for the forum. Community members there offered advice on how best to structure future town halls. All agreed that the garrison should host them, either monthly or quarterly. Most opted for a mix of brick-and-mortar style town halls with virtual ones on Facebook. And suggestions for town hall topics varied, but one thing was common: People want open dialogue with leadership and they want to know about upcoming changes within the community. The Public Affairs team also compiled feedback from the Community Leadership Information Forum, created community-wide surveys and hosted a small focus group with a handful of vocal community members. Survey results, comments and the general consensus from the focus group all reveal an underlying community demand for a public forum that caters to questions and improves the visibility of garrison activity. 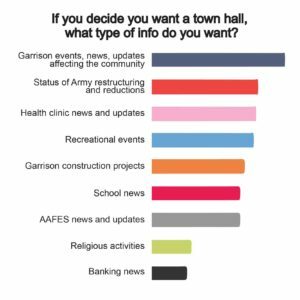 Nearly 85% of those surveyed agreed or strongly agreed that USAG Bavaria should host town halls, regardless of community participation. “It is important to give people the opportunity to ask questions, highlight issues and problems, and provide feedback,” said one polltaker. PAO went further. In addition to a public platform for two-way communication, what kind of information does the community want? 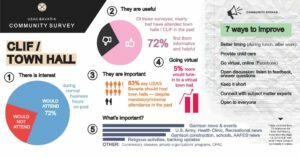 According to the survey and focus group comments, the most important types of information include updates on the garrison, U.S. Army, health clinics, recreational services, AAFES and local schools. Community members also expressed interest in commissary news, updates on closures, and more information on the Civilian Personnel Advisory Center, or CPAC, and private organizations. PAO’s next big question was on town hall logistics. Where and how do people want to engage with the garrison? Research says to go virtual, to bring news to the community — not the other way around. A large percentage of the garrison’s audience is already active online. 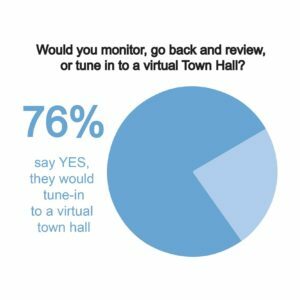 Over 75% of polltakers supported the idea of a virtual town hall. Members of the focus group also unanimously agreed that some version of an online forum — accessible from any smart phone or internet device — would best serve the community and attract greater engagement. Traditionally, town halls at USAG Bavaria have been conducted on an as-needed basis at a physical location during duty hours. They have had very low attendance numbers. Town hall participants, poll-takers and focus group participants believe the problem is primarily two-fold: inconvenient scheduling and a lack of childcare. An online town hall, which could be replayed or viewed at any time, would solve these problems. Anyone with access to a smartphone or computer could potentially ask, engage and connect. The best part? It’s sustainable and cost efficient. How will town halls look in the future? Stay tuned. USAG Bavaria is coming to you, bringing you the news you want — when and how you want it.